Organisations are integrating Emotional Intelligence into Recruitment when selecting and hiring new employees, through to development and talent management initiatives in human resources, through to transitioning people into other positions. Why is it important to integrate emotional intelligence into recruitment? Emotional Intelligence is a set of skills that help us better perceive, understand and manage emotions in ourselves and in others. Collectively they help us make intelligent responses to, and use of, emotions. These skills are as important as your intellect in determining success at work and in life. Emotions influence, both productively and unproductively, our decisions, behaviour and performance. How to integrate emotional intelligence into recruitment? Watch this video to explore how organisations are integrating emotional intelligence into recruitment and talent management initiatives. In the initial screening, they use an EI psychometric assessment to help identify candidates with high EI. Then to assess the short list, candidates are interviewed or complete role-play based simulations. Successful candidates are then on-boarded with an emotional intelligence self-assessment to introduce them to expected behaviours. Followed by confirmation to ensure the employees are demonstrating EI sufficiently in the business using a 180° or 360° assessment. 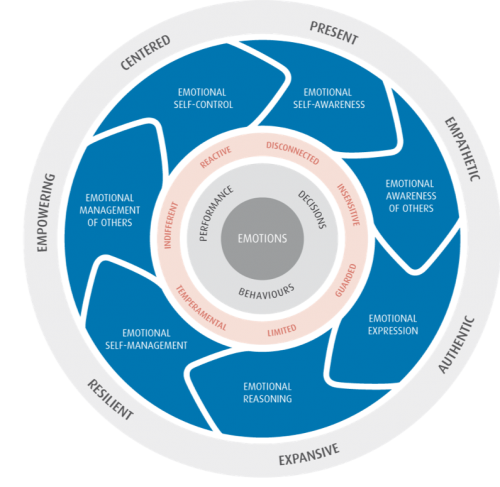 The Genos model, shown above, comprises a set of seven emotionally intelligent competencies. Competencies represent skills and behaviours, based on underlying abilities and experiences, that are measurable and observable. The Genos model captures the workplace skills and behaviours that manifest from emotional intelligence abilities. The grey, outer ring of the model shows the productive states that are typically attained by a person who demonstrates the corresponding behaviours frequently, whereas the red, inner ring of the model shows the unproductive states that may be observed of a person who demonstrates the corresponding behaviours less frequently. The Genos emotional intelligence recruitment survey is the best measure of how often a candidate demonstrates emotional intelligence in the workplace. Extensively researched and validated model and measure. Results are presented in an engaging and readily accessible format with recommended interview questions and evaluation guides. The simple and secure administration platform makes it easy to set up survey groups, monitor survey progress and download finished reports. Includes sophisticated measures of lie detection, inflated scores and inconsistent responding, and adjust scores accordingly to ensure meaningful results are provided. How to access the Genos EI Recruitment Assessment? Online training to administer the Genos EI Selection Report. An EI Certification Program to administer the full suite of Genos EI Assessments.